Another photograph by the late David Samuel Rees taken from the grounds of Abertaf. Again we are looking at the period soon after The Grouping but, subtle background differences suggest, at a slightly different time to the 1926-postmarked postcard view. 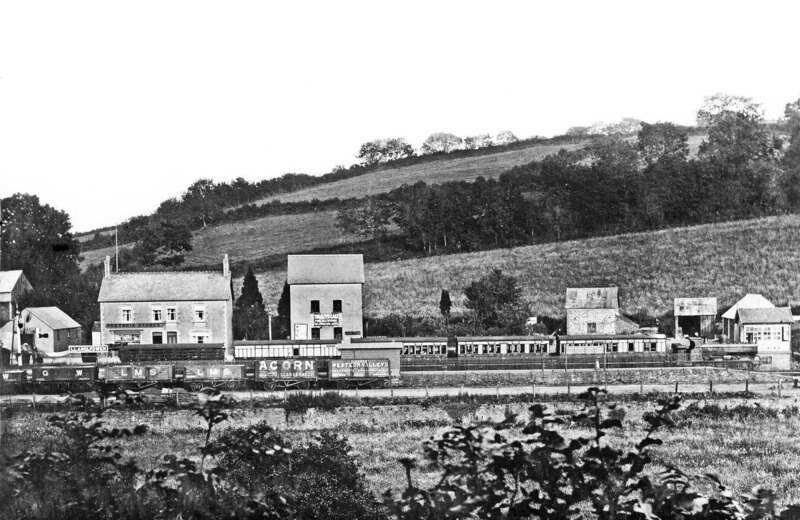 If only we could see this view in colour for, to modern eyes, it would be one of sheer delight; the ex-Cardigan train with its green locomotive and brown and cream carriages, the private owner wagons, the station livery, the river and the general greenery of the Welsh countryside. The locomotive is a halfcab 0-6-0 PT of the 1016 class. It has 'Great Western' in full on its tanks but appears to be in slightly scruffy condition. The numberplate is visible but due to the fencing only the first two digits, '10', can be discerned with any certainty while the fourth digit is either 8 or 9. The 1016 class appeared in various forms over the years, beginning life as saddle tanks, then going through a fad for side tanks before ending up as pannier tanks. Built at Wolverhampton from 1867 to an Armstrong design, the sixty-strong class became extinct by the late 1930s. Sharp-eyed observers will note there is no sign of the locomotive crew and it is not unreasonable to suspect they were in the local public house, out of view to the left. Llanglydwen was a passing place, meaning that at certain times of the day trains would need to await a train travelling in the opposite direction to clear the single track. Local anecdote handed down the generations informs us that when trains needed to wait at Llanglydwen it was not uncommon for the crew to take advantage and swiftly vanish to the nearby public house 'The Bont' (in full, 'Peny Bont Inn'). The Bont, at one time run by publican Dai Bont, was still there and trading at the time of writing. This practice of 'nipping for a swift half' was at one time not uncommon on rural railways well away from the 'powers that be' when the timetable allowed. Also not visible in this view are the station buildings but as if to compensate we are afforded a view of the signal box. The train appears to be wearing a variant of the GWR's brown and cream livery introduced in 1924. Behind the locomotive is a 6-wheel Brake Third followed by a four-compartment Composite. The third vehicle is probably a five-compartment Third; this and the second vehicle could have been either 4 or 6-wheeled. The fourth vehicle is a 6-wheel Full Brake or Luggage Brake. The sixth vehicle in an all-over livery, probably brown, is a 6-wheel 'Siphon'. Intended as milk vans, the milk being conveyed in churns, they were in practice used for anything which required good ventilation. The generous provision of non passenger accommodation on this train might suggest the photograph was taken on a market day. Keeping company with the GW and LMS open wagons, the two private owner wagons are typical of thousands once a common site across the country. Often colourful and always making sure the owners names were prominent, such wagons became, by the time of Nationalisation, very decrepit and in many instances unfit to run. With the arguable exception of a few of what we now call 'Block' trains, private owner wagons were swept away by the politics of Nationalisation and can now only be seen, splendidly restored, in museums and on heritage railways.